I just bought a TZ slot machine mod second-hand. No instructions...does anyone know how these connect? Any help would be appreciated. I was under the impression it went to any GI bulb and basically just stayed lit up. As the ball rolls through it, the ball makes contact with the lower portion of the reels and spins them. Cant remember if the light was hooked up to the slot machine light, or always on? 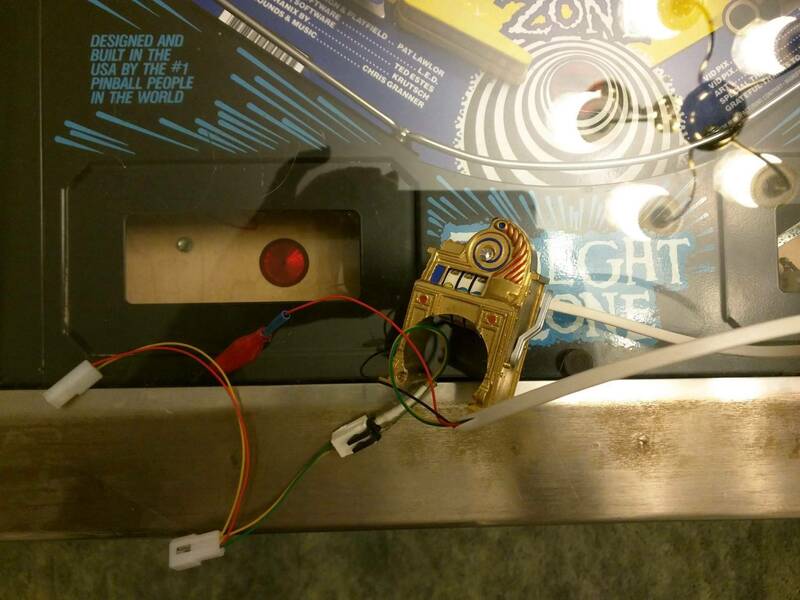 Hmmm....but the slot machine lamp gets hooked into molex underneath right? So what kind fo connection doews this thing have on the other end JK2171? The ball will get stuck under this mod, about to remove this mod do to regular ball hangs. Keep this in mind before you install it. Interesting....never had it happen on mine. You have to take off the Gumball sign, and the slot machine mods gets screwed down under the Gumball sign. You can bend it slightly to adjust how the ball goes through. I haven't had my ball get stuck because of this mod. Perhaps there are different producers of this mod, and yours may not be the same as mine. 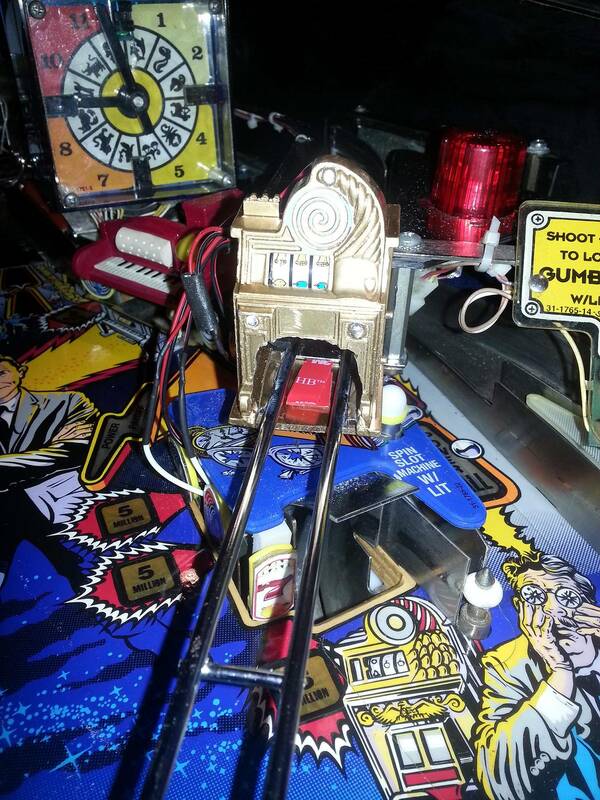 The wires go down under the plastic below it, and through the hole in the playfield. Underneath is the yellow slot lamp block connector that you have to disconnect and put the transformer (?) in between. Also, you have to fit the 555 bayonet bulb holder of the mod into the "super slot" bulb spot. This is my recollection as well in regards to hooking up to a GI bulb. I thought as well that the reels would move automatically, but they don't, they move when the ball passes through. Don't tighten too much and you shouldn't have problems with ball hangups. Thanks for all the advice so far. Picture below for reference, hopefully it's the same as what has been suggested. Had this mod for a long time and it works perfectly every time. No issues with mine. This is diff'rent then mine. How many lights does it have on it? I'll explain mine, maybe it will help. Mine also has a blue light on top that runs to the Super Slot lamp board...it would appear that yours does not have it. Thank you, TheLaw. This is great instruction. Hopefully I will have it in a couple of days. I will follow the advice you've given. Got my mod yesterday. I'm still unsure as to what this sits on. Does it sit on the metal ramp? Sits on the metal ramp that travels over the slot machine scoop. Well, I built this from scratch, used the $4 pencil sharpener on eBay. Hats off to those that can make and sell it, it's not easy and very tedious at times. Took me like 4-5 hrs from scratch, but I got it and it looks and works awesome. I had to paint it and then dremel out part of the front and back, had to make a support bracket, install the LEDS and then wire it up (GI, super slot door panel, and the light next to the slot machine). The reel spins when the ball passes through it. Mounting it is fiddly as it has to be just right so reel spins, but not too low or ball gets hung up. It's probably the coolest mod I've seen and built. You won't see me selling this one and for newbies, I'd say the $100+ price is probably well worth it.